When I first met and interviewed Cleveland rapper Machine Gun Kelly in the summer of 2010, he seemed eager. He was working on Lace Up, his mixtape that would come in at No. 30 on XXL magazine's list of the 100 best mixtapes of 2010. As we spoke about his past, his family, and his style, Kelly really seemed to light up when we spoke about his music and upcoming projects. A little more than six months since I spoke to him, Kelly touched down at the University of Missouri to kick off the out-of-town portion of his Lace Up Tour, bringing with him DJ Xplosive, his personal DJ, and his hypeman. Columbia is a small university town sandwiched between Kansas City and St. Louis, where hip-hop heads are used to the sounds of Tech n9ne and Nelly ringing out of their headphones. While the medium-sized venue wasn't close to being sold out on Friday night, a sizaeble crowd lingered by the bar in the back before meandering to the floor to watch Kelly rock. And rock he did. 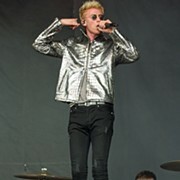 While the crowd was dormant during the five underwhelming opening acts, they were awoken by MGK's energy from the minute he strolled onto the stage. 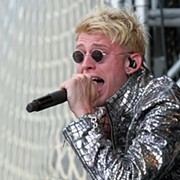 Wearing a dark jacket over a black T-shirt, both of which would be removed by the show's end, Kells warmed up the crowd by bobbing to DMX and dancing to Kid 'n Play before getting into his set list. As Kelly danced around the stage, jabbing his fist into the air as the beat faded in and out of the speakers, the crowd soaked it up, hands in the air, feet leaving the ground as they jumped around like mad men right along with Kelly. A smile crept over Kelly's face — like he couldn't quite believe that this small crowd from the middle of Nowhere, Missouri, knew the words to his music. A few of the opening acts watched backstage, some reciting the words as Kelly rapped them, other nodding their heads in rhythm with the beat, all seemingly entranced by the Cleveland native. After the show, Kelly hung around to sign copies of Lace Up, which were passed out during the show. As I approached him, he turned to me and said, “I can't believe this many people showed up.” It seemed like he almost didn't believe his name was recognizeable outside of Ohio's borders.